It’s that time of year when nature starts showing its richest colors… and you start seeing cauliflower in brilliant shades of gold and purple. In our house we love purple cauliflower when it’s roasted, mashed, or best of all, made into soup – yes, purple soup. This quick and easy soup is rich and comforting, and it has a faint hint of sweetness from the coconut milk. That, and it comes together in just about a half hour, which makes it pretty much the perfect soup. 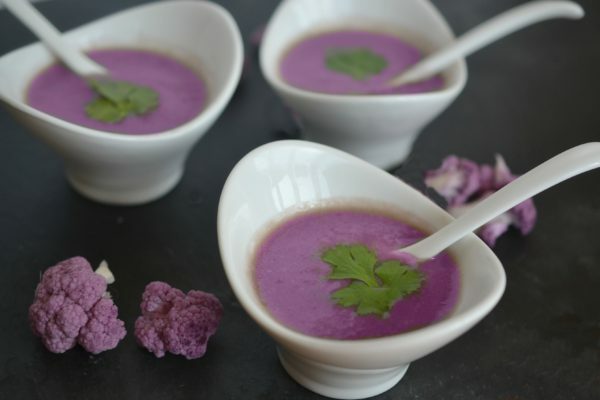 It’s adapted from a purple cauliflower soup recipe by ChezUs, swapping out broth for coconut milk to make it creamier. A rich and comforting vegan soup that gets it unique color from purple cauliflower. Heat the olive oil in a large stockpot. Add the garlic and shallots and saute on low heat for about five minutes or until translucent. Add the cauliflower and cook for another five minutes, ensuring that the cauliflower is evenly coated with the oil. Add the vegetable broth and coconut milk and bring the mixture to a boil. Reduce heat to simmer and cook, uncovered, for 30 minutes until cauliflower is soft and the soup is slightly reduced. Remove from heat and puree with a food processor or immersion blender. Add salt, adjusting for taste. Re-heat if necessary and serve. 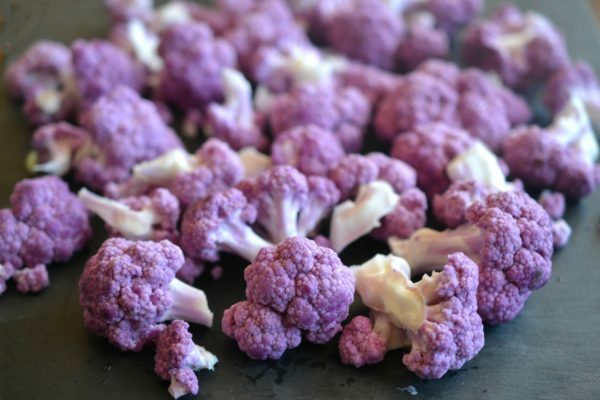 Oh, and by the way, purple cauliflower isn’t just pretty to look at – it’s extra-good for you too. According to nutritional biochemist Michael Peluso, “The purple color is due to the presence of a subtype of flavonoid compounds called anthocyanins, which may help to regulate your blood lipid and sugar levels and body weight, as well as help to lower your cancer risk.” Good deal! 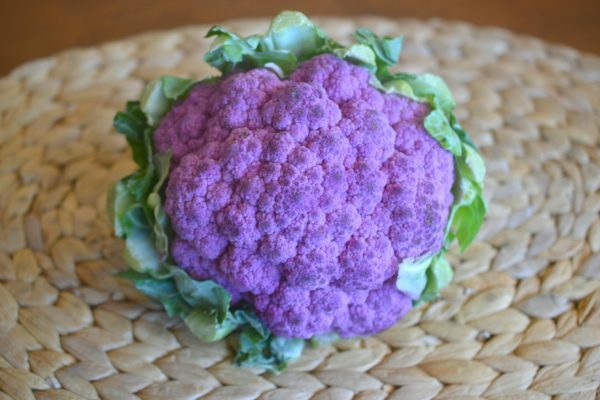 Have you had purple cauliflower? If you have another favorite way to eat it, let us know in the comments. 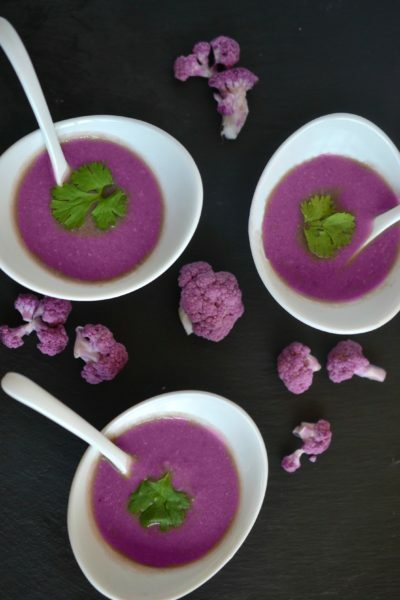 I LOVE purple cauliflower and can’t wait to try this soup! So pretty!!! How much food coloring was added to that soup? Hi Chef! No food coloring!